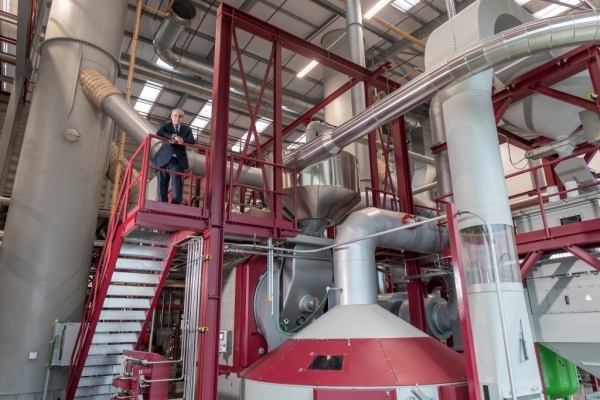 Costa Coffee has this week turned on its new £38m roastery signalling a major milestone in the business’ expansion to serve an increasingly global customer base. 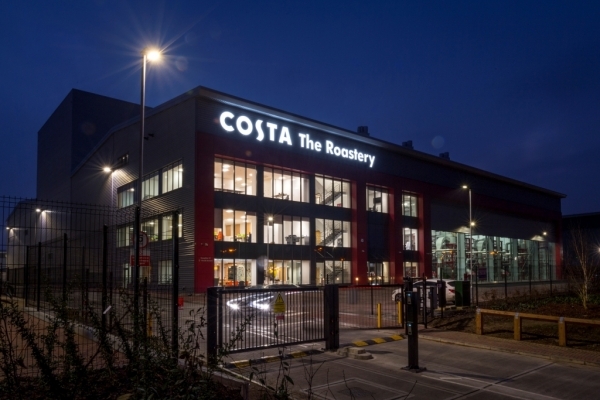 The £38m new facility has more than quadrupled Costa’s roasting capacity from 11,000 tonnes of coffee per annum to 45,000 tonnes per annum, providing the platform for its national and global growth plans. Rapid growth in the UK and internationally has driven up demand for Costa’s famous coffee. The new roastery is a response to that demand and will provide the infrastructure for sustained global expansion. Construction started in November 2015 on a specially chosen site in Basildon, Essex close to Tilbury Docks where its raw coffee beans are imported. Named Paradise Street, the new facility is one of Europe’s biggest coffee roasting facilities and covers 85,690 sq ft – or the equivalent of over 30 tennis courts – and will enable Costa to produce coffee for 2.1 billion cups of coffee per year. It is expected to operate for the next 20-30 years. As well as roasting to the same great quality and flavour, the new roastery is carefully designed to improve efficiency. Green coffee beans from Rainforest Alliance certified growers are shipped from coffee producing countries to Tilbury Docks just 14 miles from the roastery – this is half the distance to the old Lambeth roastery meaning fewer road miles and much improved supply chain efficiency. Once the beans arrive, new production methods now allow the receipt and storage of 24 tonnes of green coffee per hour – up from 6 tonnes at Lambeth. Whilst roasting that coffee, state-of-the-art in-house processes will increase productivity by 25 per cent compared to the previous roastery. The new roastery also includes a new coffee academy to train 3,000 baristi per year, putting investment in people alongside investment in great coffee. Expert barista service is central to the Costa brand and customer experience. Paradise Street will also be one of the most sustainable industrial buildings in the world and will operate on a zero waste-to-landfill basis. On-site renewable energy generation will further reduce the building’s carbon footprint, with the roof hosting a 249kw solar PV system which will provide power for the roastery. In tandem with the rainwater harvesting system, this will also generate hot water for the building. Already achieving BREEAM ‘Outstanding’ accreditation (Building Research Establishment Environmental Assessment Methodology is the world’s leading design and assessment method for sustainable buildings) during its design stage assessment, the roastery is also shortlisted for the 2017 BREEAM Awards and aiming to receive a further ‘Outstanding’ certification at the final stage assessment. The design brief for the new roastery was to focus on quality and sustainability, ensuring that Costa’s high quality coffee standards were met but with the minimal environmental footprint, as Whitbread, Costa’s parent company, is targeting to reduce emissions by 15 per cent from its 2014/15 baseline by 2020. Costa is therefore investing in ensuring its new roastery meets the highest environmental standards, targeted to achieve BREEAM ‘outstanding’ accreditation, making it one of the top 10 industrial facilities in Europe for sustainability. Contributing to its energy and water efficiency will be solar photovoltaic roof panels generating approximately 250 kW and a rainwater harvesting system for recycling and re-using water. The building and the internal roasting equipment will also have a wide array of other sustainability features, drawing on lessons learned from Costa’s innovative Eco Pod coffee shop and wider environmental innovation across Whitbread and its Premier Inn business.